I‘m one of those backpackers who set foot on a long trail years ago, and haven’t been able to tear myself away from the freedom of a good long hike. It got to the point that after my PCT thru-hike in 2006, I decided to ignore the fact I had just gotten a master’s degree in design, and focus on finding a job where I could get paid to hike. That’s the dream, right? Well, I tried leading trail crews, guiding, teaching light-weight backpacking courses, leading wilderness therapy trips, working for Outward Bound, and finally after years of earning enough to barely pay my bills (and hiking a few thousand more miles), I decided to settle down in a regular job. Truthfully, I had to find a way to save for my next thru-hike. I still found time to get creative with my passion though, and founded Hikertrash with friend and fellow thru-hiker Brian Frankle. 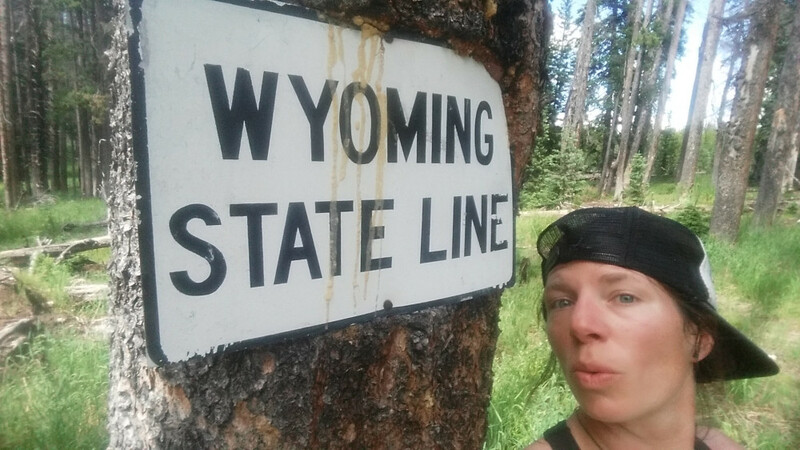 Fast forward to the end of 2015; I returned home to Bend, Oregon after finishing the Continental Divide Trail (and Triple Crown!) and found myself spiraling into the despair of life off trail. But out of the depths of discontent came the dream job: managing the new Oregon Desert Trail. Getting paid to hike! The origin story for this 750 mile trail started with a thru-hiker’s sleepless night. Brent Fenty, Oregon Natural Desert Association’s (ONDA) executive director, lay awake one evening imagining a way to connect the highlights of Oregon’s high desert, a desert you may be surprised to find covers almost half the state. For this avid outdoorsman (and former PCT thru-hiker), a trail seemed the natural solution to this idea. 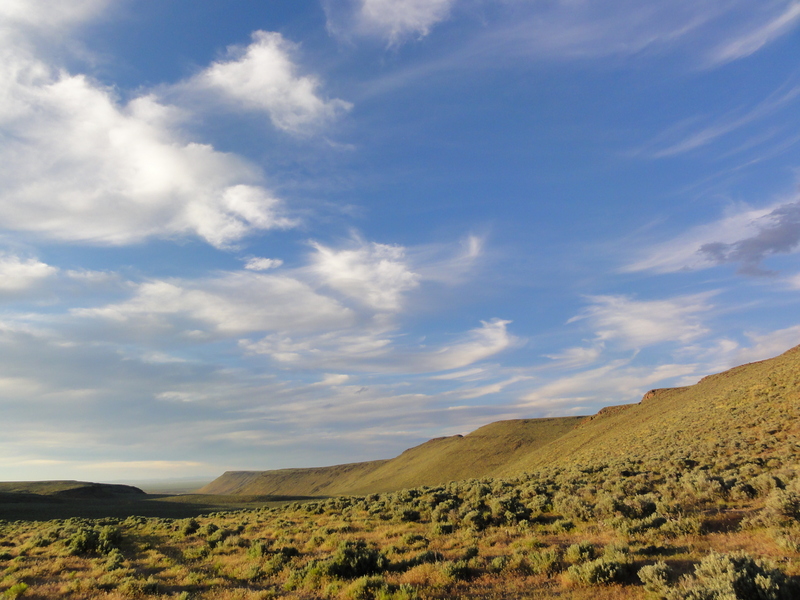 By connecting the remote and stunning regions in Oregon’s high desert like the Hart Mountain National Antelope Refuge, the Steens Mountain, and the Owyhee Canyonlands with a trail, hikers could be immersed in the very land ONDA has been striving to protect for 25 years. Perhaps by introducing more people to these amazing landscapes, the Oregon Desert Trail could help foster a sense of responsibility: responsibility to help protect, defend, and restore Oregon’s high desert for generations to come. 2011 kicked off three years of inventorying and ground-truthing the route, and through the thousands of hours of volunteer and staff work, the Oregon Desert Trail (ODT) emerged as an immersive desert experience that can be explored through cross-country travel, old roads, and existing trail. What’s in the Middle of the Desert? By nature, the Oregon Desert Trail is a remote backpacking experience. The desert in this part of the country is sparsely populated, and one will be much more likely to see herds of pronghorn antelope and the well-camouflaged sage grouse than other people. On the flip side, the remote nature of south eastern Oregon boasts one of the last uninterrupted night-skies left in the country. No light pollution means unparalleled views of the Milky Way and stars you could only dream of in the city. Volcanos and plate tectonics play a big part in what makes this part of Oregon unique. Hikers will walk among 80,000 year old lava flows in the Badlands Wilderness, and brush the edge of the largest fault block mountains in the country along Abert Rim and Steens Mountain. Active faults also mean hot springs! The trail passes near the developed Summer Lake Hotsprings and Hunters Hotsprings, as well as Hart Mountain Hotsprings, Alvord Hotsprings, and several soaking pools in the Owyhee Canyonlands. There is nothing better than a soak after a long day of hiking, and the ODT provides! There are challenges to a trail of this type. 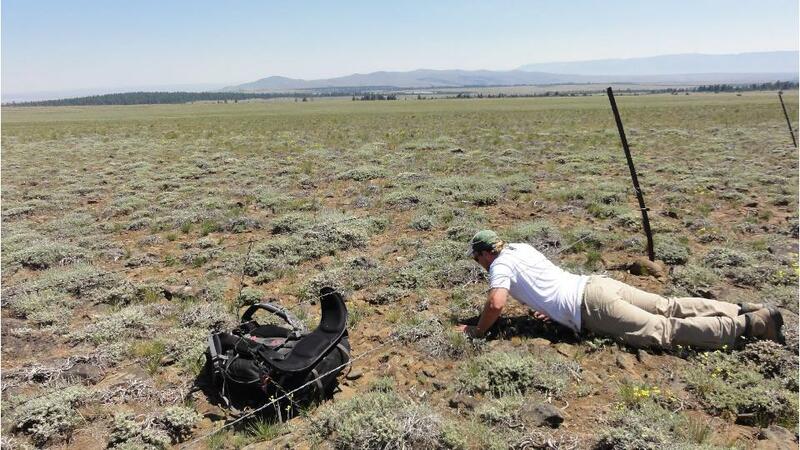 At this stage, Oregon Desert Trail hikers need to be experienced with map and compass and/or very comfortable using a GPS device as the route is unmarked and contains quite a bit of cross-country travel. However, for those looking to break free from a traditional trail experience, this is the hike for you. There is freedom in the desert, freedom to make your own routes, to explore a near-by peak or canyon, and truly immerse yourself in a trail that isn’t quite a trail. Water can be quite elusive in this part of the state, and hikers need to be prepared for long distances between water sources, or to cache water for themselves. 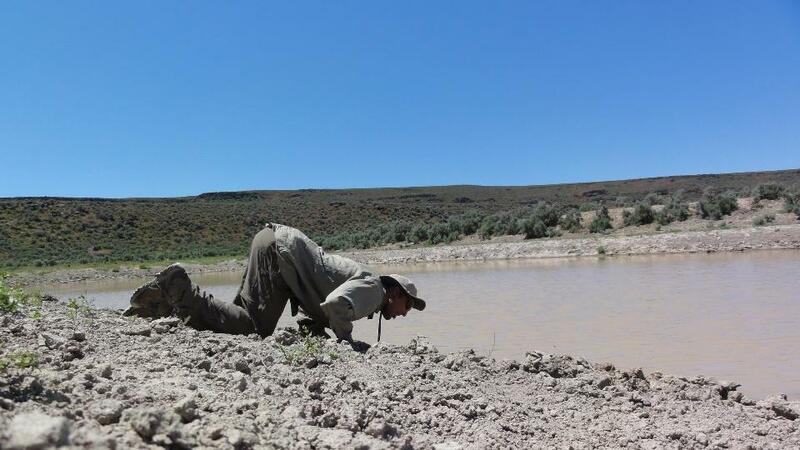 Water availability is perhaps crux of the hike on the Oregon Desert Trail. But never fear, there are plenty of resources available to figure it out. 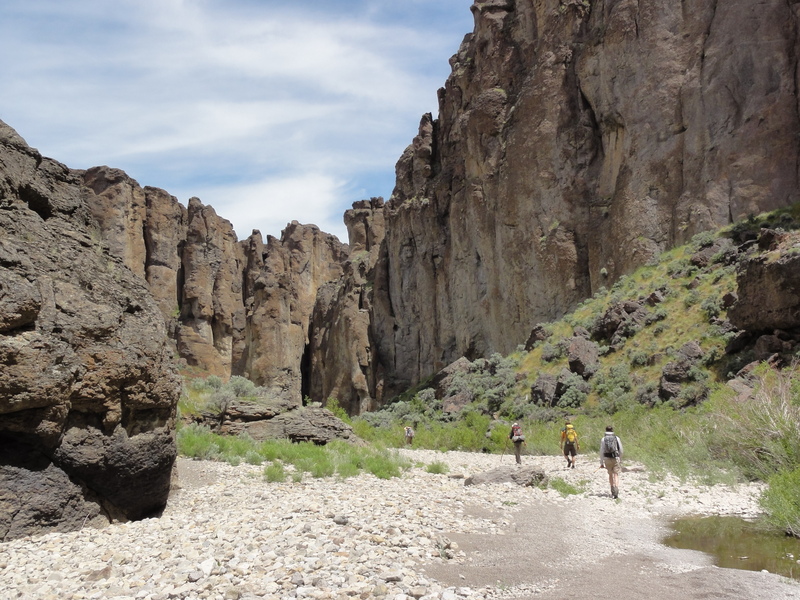 All of the folks that have headed out on the trail so far have hiked from west to east (or from Bend to the Owyhee Reservoir) and four of the five hiked in late May/June/early July. Lots of the water is seasonal and much more available in the spring than the fall, but it’s still doable. Just be prepared to carry more water if you decide to go with this option. Summer is bloody hot out there, so it’s probably best to stick to the shoulder seasons. And speaking of water, the last 200 miles of the trail are primarily in the canyon of the Owyhee River. Wading, a bit of swimming, and crossing back and forth to find the best route of passage is to be expected. Or if you are like me, you can packraft it. Going downstream in this case is probably much easier than trying to walk or paddle upstream, but if you like a challenge maybe you can be the first person to hike from east to west! So How do I Hike it? The first thing I did when starting to work on the trail was give all the resources a good once-over from a thru-hiker’s perspective. Because I haven’t hiked it yet, I approached the task like I was embarking on the most detailed planning of a hike ever. I know if I can get the materials in the shape I would want them before setting off for 750 miles, they would surely be helpful to others wanting to do the same. Maps – The trail is broken down into 4 regions, with each region spanning about 160-200 miles. In those 4 regions we have 25 sections, each with detailed maps indicating the type of tread (cross country, trail, or road), waypoints, mileage between waypoints, water sources, trail town info, and declination information. Databook/Waterchart – I love a good databook. I immediately went to work creating one based on the observations and feedback from our 5 thru-hikers, data found on the maps, and info included in the first version of the ODT guidebook. In addition I included a water chart which ranks water sources from reliable to questionable to unreliable, and color coded them to match the maps. I’ve included historical data from the past 5 seasons hikers have been inventorying or hiking the trail, and have a column for this year’s hikers to include their information on water sources. Better yet? It’s a Google Sheet; hikers who like to use their smart phones can download and update the chart electronically when they are hiking. Once connected to data or Wifi again the info will update automatically for the next hikers. Guidebook – It’s nice to have a play by play account of what you will encounter in each section of the trail, and the guidebook will tell you to “take a left at that tree,” or “look out for pictographs around the next corner.” It references the waypoints on the maps and the databook and includes a bunch of helpful information on planning your hike. Hiking Project Website & App – This is the age of the app. I loved using Guthook’s CDT App on the trail last year, if only to reassure myself from time to time that I was going in the right direction. We’ve teamed up with the Hiking Project to get the first 160 miles of the trail on their website and free app (and are aiming to include the rest of the miles by the end of the year). Included are elevation profiles, a slimmed down version of the guidebook, and a real-time view of where you are on the route at all times. Important junctions between cross country and trail sections are marked, as well as water sources…and all match up with the waypoints and info you will find in our other ODT resources. And yes, it can be used on airplane mode! Water Cache Guidelines & Maps – So the first 160 miles of the trail isn’t doable without caching water. But luckily the hikers who have already completed the trail gave us detailed notes and maps on where they cached their water. We also drafted some caching guidelines because caching can be a tricky thing if you’ve never done it before. Now depending on how many miles you like to hike a day, you may want to cache more than what is suggested, and as time goes and more people head out into the desert we should have more and more information available. Town Guide – I’ve identified 16 communities along or near the trail that could provide important services to hikers along their journey. Town can be a generous term in some cases as many spots along the ODT consist of a single store/gas station/restaurant/bar/post office all in one building. I’m in the middle of creating maps of each town with a directory of where you can eat, resupply, sleep, and more. As Huck Finn mentioned, not many people in these desert communities know about the trail or the “crazy” people who want to hike it, but I have been and will be visiting all of these places to spread the good word and let them know some dusty, tired hikers will probably descend on their towns to clean them out of nachos, pizza, and beer. I’ve got LOTS of plans for this route. A few things I’ve been dreaming up include exploring other ways people might like to get on the trail like bikepacking, packrafting, skiing, and horseback riding. Parts of the trail can already be biked like in the Fremont National Forest near Paisley, and we’ve started scheming up a way to create a parallel bikeable route for the whole trail. I’ve already mentioned you can packraft the Owyhee River, and other rivers like the Chewaucan and Donner und Blitzen river are floatable certain times of the year too. How about a ski tour? 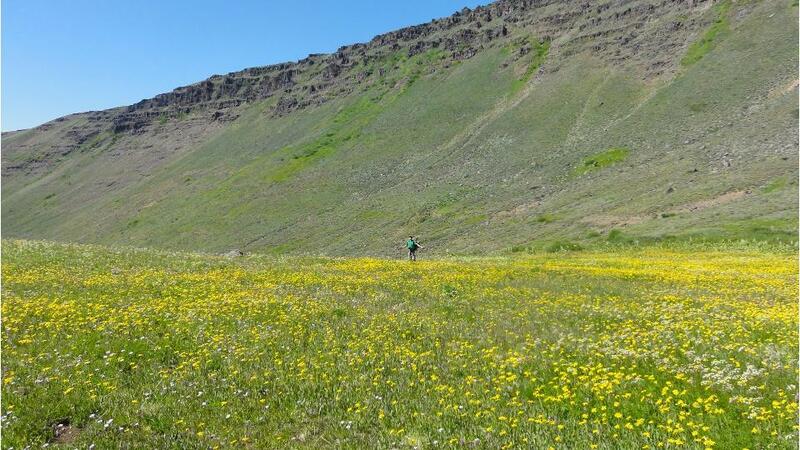 The Steens Mountain could offer some stunning terrain for your next winter adventure, and horse packers will love the remote and beautiful country. The ODT passes near some caves which hold traces of human DNA dating back 14,000+ years. There is an incredible amount of human history in this area of the world, and don’t be surprised to find arrowheads, pictographs, and old hunting blinds. I’d love to develop some resources so hikers can learn more about this area…that also includes the incredible geology of the area and the rich wildlife that can be found among the sagebrush seas. Perhaps we’ll hold some educational hikes, or suggest what reading materials to carry with you so you can learn all about the place you are walking through. Just on the other side of the Cascade Mountains from the western terminus of the Oregon Desert Trail is the PCT. Maybe we can link into that trail, and connect to the Idaho Centennial Trail in the east. 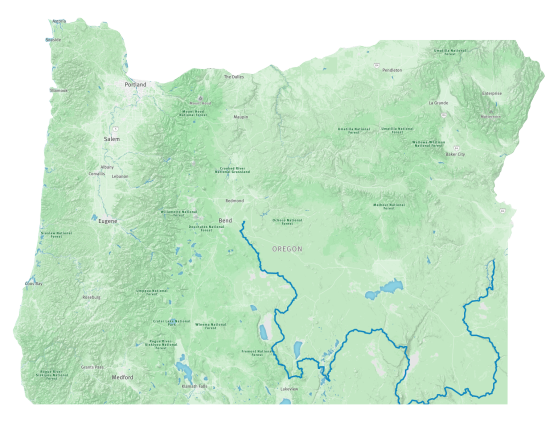 Maybe we can make a loop in northern Oregon that could take hikers through the equally impressive Wallowa and Blue mountains. I’ve only been on the job for three months, but like I said: DREAM JOB! Stay tuned as the resources get refined and more hikers get out there and experience the remote and incredible beauty of Oregon’s high desert. One of the best ways to support the development of this trail is to get out there and hike, but becoming a member of founding organization ONDA is a good one too. And please, check out the website for all the resources mentioned above, and let me know if you have any questions. I love dreaming big! Thanks for the suggestions Bob, who knows what is possible! 2) The picture of a hiker scooting under a barbed wire fence… and mention of roads. How much of your trail is on roads? How much crosses private land? Dream job for sure! I love your enthusiasm! I’m excited to learn more about the ODT. I’ve made two visits Burns/Steens Mountain area over the past couple of years. It’s a magical area, I’d love to spend an extended amount of time wandering amid all that beauty. Thanks Kelsie, hope to see you out there some time, it’s such beautiful country! on the trail that goes form Vee Lake to California through the Warner Mts. Awesome Cam! I’d love to include info on your cabin in our materials, I’ll be in touch soon! Renee: Thinking of doing some sections soon. Is there a printed guidebook w/maps? I prefer Old School/low tech/no gizmo’s hiking. Or I could just print up everything off the internet I guess… hiking season, I live for it! Thanks.